Textbook: Saferstein, R. Criminalistics, 11th ed., 2015. An older edition is okay. It would also be a good idea to have an organic and quantitative analysis (or instrumental analysis) textbook handy. "This was a lofty chamber, lined and littered with countless bottles. Broad, low tables were scattered about, which bristled with retorts, test-tubes, and little Bunsen lamps, with their blue flickering flames. There was only one student in the room, who was bending over a distant table absorbed in his work. At the sound of our steps he glanced round and sprang to his feet with a cry of pleasure. 'I've found it! I've found it,' he shouted to my companion, running towards us with a test-tube in his hand. 'I have found a re-agent which is precipitated by hemoglobin, and by nothing else.' Had he discovered a gold mine, greater delight could not have shone upon his features. 'Dr. 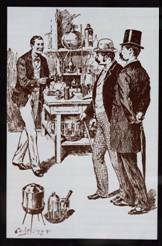 Watson, Mr. Sherlock Holmes,' said Stamford, introducing us." Forensic Science plays a critical role in our society and public intrigue has certainly increased with the popularity of several recent television shows. You will see that Forensic Science is a broad, interdisciplinary subject. In its broadest context, forensic science can be thought of as the application of scientific principles to all matters of the law. This can include criminal or civil procedures. In this course, we will be concerned with criminal justice aspects. However, even in this context, consider the scope..biochemical applications to bloodstain analysis or the examination of other body fluids. Knowledge of biology would be required for the examination of human tissues, physiological fluids, pollen, and leaves. Physics is often used in crime scene reconstruction..velocity analysis and metrology to determine the amount and/or direction of force. Materials science is needed during the examination of concrete, paint, glass, dyes, and ceramics. Anthropology relates to the examination of bone, teeth, bite marks, and hair. Mathematics, statistics and probability are important when considering the frequency of occurrence of artifacts and distribution patterns. Geology and microscopy are other important disciplines used in the forensic sciences. "Forensic Chemistry" would then be the application of chemistry and chemical principles to matters of the law. So, what is "forensic analytical chemistry"? Many view it as "applied analytical chemistry", but that's probably an oversimplification. While forensic chemistry and analytical chemistry share much in common and consider similar questions, such as: "what and/or how much of a given item is in a given sample? ", there are differences. For example, forensic chemists often would like to know what the sample originally was, where it came from, and how it got from one place to another. The analytical chemist may be able to determine if a particular liquid is water, but the forensic chemist may want to know if this is lake water, sea water, water used in a particular chemical process, or water resulting from a chemical synthesis. To answer these questions, the tools available to forensic analysts are often the tools found in analytical labs. The purpose of this course is then to examine the analytical methods of analysis used in forensic lab work. The course will introduce and educate you to the types of samples often encountered in forensic work, and the many types of instruments and techniques available for chemical analysis and the type(s) of information these instruments provide. It is my hope that you will then expand your knowledge of the types of analyses and instruments you come into contact with during your scientific career. It is also noted that practitioners in the forensic field often have a solid and high quality scientific background and an education that is multidisciplinary. Other skills that are necessary include the ability to think creatively, exhibit good judgment, and independence. Winthrop University's faculty adopted a set of four University Level Competencies (ULCs) that describe the qualities our students develop during their Winthrop career. It is easy to see that this course involves solving problems and developing written communication skills. However, you will also learn the responsibilities of chemists to the greater good of our planet and society, as well as the global nature of the chemistry enterprise. Within the discussions of chemical analysis instrument design and applications to forensics, I think you will find this course fits well with all four competencies. Competency 1:Winthrop graduates think critically and solve problems. Competency 2:Winthrop graduates are personally and socially responsible. Competency 3:Winthrop graduates understand the interconnected nature of the world and the time in which they live. Competency 4:Winthrop graduates communicate effectively. Winthrop University graduates communicate in a manner appropriate to the subject, occasion, and audience. They create texts - including but not limited to written, oral, and visual presentations - that convey content effectively. Mindful of their voice and the impact of their communication, Winthrop graduates successfully express and exchange ideas. Have a broad knowledge of the analysis of drugs, combustion, firearms, and polymers. Homework (30%): Periodically, homework problems will be assigned as handouts, and collected. Due dates for each assignment are the final date each assignment will be accepted. Your lowest homework assignment will be dropped before averaging. Cumulative Final Examination (20%): Thursday, December 6, 11:30 a.m. - 2:00 p.m. If you score higher on the final exam than your lowest mid-term exam, the final exam grade will replace the lowest exam grade, before averaging. You are expected to attend each class meeting for the full scheduled time. This is a difficult upper-level course and attendance will help you concentrate on the appropriate material and reinforce the assigned readings and problems. You are required to bring pencil, paper, textbook, and a scientific calculator to each class. Cell phone calculators are not acceptable. Winthrop University is committed to providing access to education. If you have a condition which may adversely impact your ability to access academics and/or campus life, and you require specific accommodations to complete this course, contact the Office of Accessibility (OA) at 803-323-3290, or, accessibility@winthrop.edu, as early as possible to discuss your concerns. Students wishing to receive graduate level credit for this course are required to complete a 5-7 page review paper on a cutting edge analytical technique applied to criminialistics. Resources can be found by reviewing either the "Fundamentals Review" or "Applications Review" issues of the journal, Analytical Chemistry (June 15th issue of even & odd years, respectively). The paper must cite a minimum of 10 primary literature sources and must be submitted by December 6, 2018. Graduate students should be aware that Winthrop's +/- grading system is not applicable to courses taken for graduate credit. Letter grades will be assigned as follows: 92%-100% A; 83%-91% B; 74%-82% C, 55%-73% D.
While unlikely, the Professor reserves the right to change the course syllabus if circumstances dictate. You will be notified of any change via class meeting time and/or email. *Schedule is subject to change, if weather or events make it necessary. Read the textbook and notes. Know how to do mean, standard deviation and linear regression (slope/intercept) with your calculator. Work the homework problems by yourself, without any aid (at least once). Review & tweak your notes right after class. Did I mention, read the textbook and notes? Talk to your professor, especially if you're confused. Even if you have a study group, spend some quite time alone with the material each day. Finally, read the textbook and your notes!